A passenger railway going inside an urban area was called the METROPOLITAN RAILWAY (urban train system), in modern English: METRO. The first metro was opened in London and later most of it was soon built underground (under the city), so it was then called THE UNDERGROUND, even to this day. 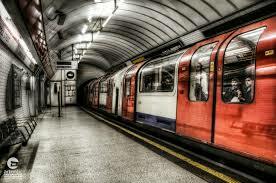 But in general, in the UK we usually call it THE TUBE, because it mostly goes (or went) inside a tunnel, a tube. In America the first metro was built in New York, and it was called SUBWAY because it was built mostly under the streets (sub= under / way= road), since Manhattan street plan is quite a regular grill and it was easy to do so. We use the word METRO to talk about most of the foreign underground systems in other cities: Paris, Moscow, Madrid, Shanghai, Beijing... but we use "subway" for other cities like Tokyo, and for example in Seoul it is "Seoul Metropolitan Subway" (not sure if people there simply says "metro" or "subway"). Glasgow, though it is in Britain, uses the word "subway", but in the rest of Great Britain "subway" is an underground passage for pedestrians (to cross under a road or street). In America "metro" is usually short for "metropolitan area" (a big city and its area of influence).